California community health centers are an essential provider group in the Medi-Cal program, and Medi-Cal is the most important payer for a majority of health centers. As conversations around payment reform and care delivery transformation progress, health centers can benefit from better understanding “where plans are coming from.” To gather practical insights that health centers can use to build mutually beneficial partnerships with Medi-Cal managed care health plans, a JSI research team interviewed experts in the field with a special qualification: their careers included roles at both health centers and public Medi-Cal health plans. We asked these individuals with both medical and administrative backgrounds to reflect on what they wish they had known about health plans when they worked at a health center. 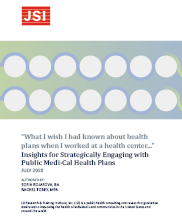 This brief synthesizes seven key insights based on our interviews, conversations with key informants on strategic health center-health plan partnerships, and literature review. We are grateful to Blue Shield Foundation of California and the California Health Care Foundation for their generous support of this research.